Home » New Release » Dromida Kodo Camera Equipped Quadcopter for $59.99! For the low price of $59.99, the Kodo brings a lot to the table! 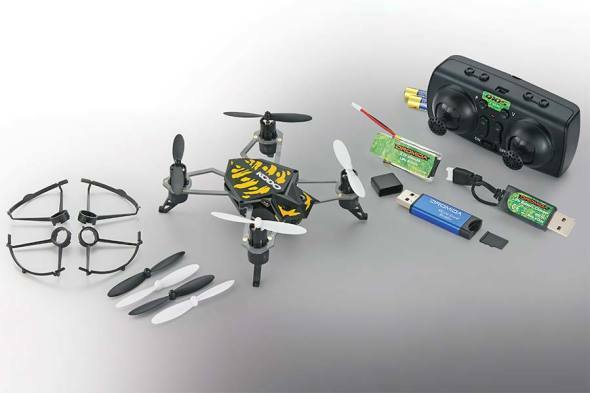 This micro quad package includes a 2.4GHz radio system that uses three different flight modes to allow pilots of all levels to successfully take to the skies for aerial imagery. Beginners can earn their wings using the Easy mode and then progress onto Normal mode. More experienced pilots can go straight to Expert mode for a wider flight envelope. An Auto Flip feature delivers pro-style flips with the touch of a button. Advanced sensory hardware includes a three-axis gyro and three accelerometers; they work together to create smooth and stable flight. Click through to this LINK for more information or to purchase!